Do you ever get stuck for a quilting idea? » What's Under the Needle? 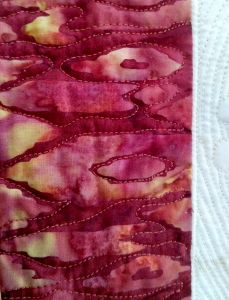 home » What's Under the Needle » Do you ever get stuck for a quilting idea? Do you ever get stuck for a quilting idea? 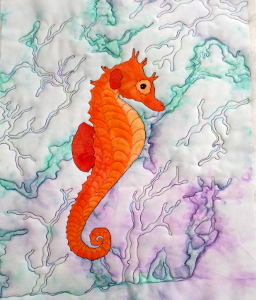 Do you ever get stuck for an idea to quilt a background or border? Usually, you just need a little quilting to hold the layers together, or reduce some bulkiness. Simply following the fabric lines or design often works very well. 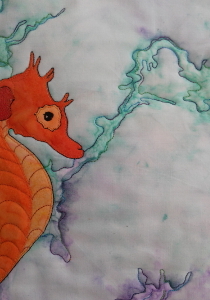 I decided to do this on the background of my seahorse this week. It had such decorative lines that I wanted to capture them. After I'd finished, it seemed like there wasn't enough so I decided to add a few more using a similar design. This is not the first time I've used this technique. 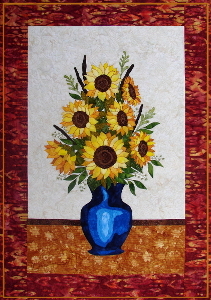 Last year I used the same idea on the border of Sunflower Bouquet. 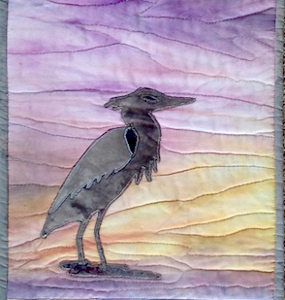 And Anita used it recently in her quilt Wading Heron. So next time you are stuck for a quilting idea, perhaps this will work for you. Big idea! I had never thought of that! Loved it!